Photoshop plays most important role for printing on fabrics. We can do printing on any kind of fabrics for any garment . Its very user friendly to give their own instructions to machines. 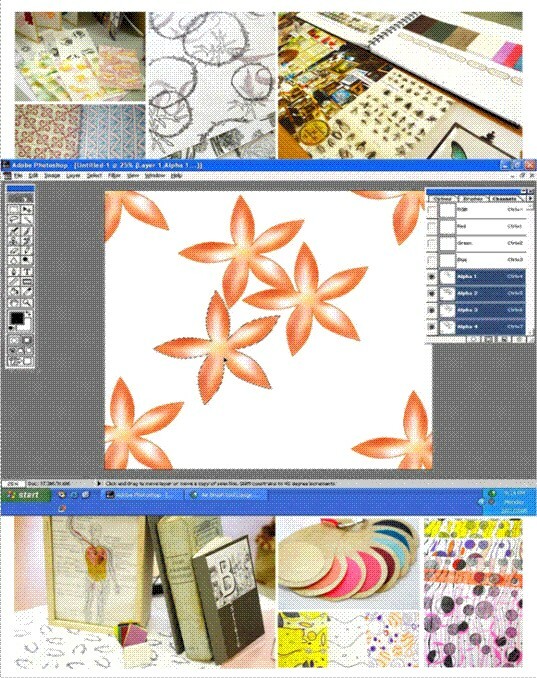 There is different and so many ways to create design in this software. Like we can take out any hand creations or sketches directly in this software. And can develop designs or we can play over designs in multiple way by using different tools. Before creating a design, for production point of view the most thing to remain is to give a particular size of preparing design. There is many different standard sizes are available according to printing machines. We follow different sizes for different printing styles like rotary print, screen print etc. or digital printing. All depends on designs and printing style or machinery. We must take care of to set size and resolution and color mode. CMYK OR RGB for clothing we set color mode in RGB. To develop a design We go through by many ways, we can create many motifs by given different shapes quickly by using pen tool and then we can create and can apply our visualization in multiple way so we can provide so many options to develop best design creation. After creation of motifs we apply colors all colors and we can pick specific colors by piker tool or we can set by own. We can apply multiple color teams. In textile prints there is most important role of offsets/repeats, only repeats makes complete your design or we can say it convert motifs into designing form without set a offset we can not create all over print . to make a offset generally we take a single motif or can use also multiple motifs. Offsets can set multiple design repeats or style on horizontal or vertical edges that make continuation during printing on cloth. For rotary and screen printing we do coloring by using channels in Photoshop. We use different channel for each individual color. And if we give some effects in design for that also we have to use different channel. Mainly Channels are used for rotary and screen printing. We can put many effects also like little doted effects we have to set bitmaps for the different size of bitmaps we have to set individually size of bitmap. Before giving production we check out actual size of print what goons and can checkout the actual what size will be print. It was all about rotary and screen printing style of designing in software which we keep in mind before creations. Now this time that’s called DIGITAL if we talk about digital textile prints which is growing too fast and vast also. For digital printing Photoshop software is mostly used and its very user friendly. For digital printing there is no limitations for sizes of prints we can set up according requirement. Even we can create an individual print for whole garment without any repetition. For digital prints we do work on layers, we can use many layers, or we can use single layer also for different creations. Photoshop helps too in reproduction of prints. We take exact size maps of fabric sample and can re produce any printed design.